Curious, playful, and intelligent—the Nova Scotia Duck Tolling Retriever is an eager and affectionate gundog and companion animal. This hardworking, playful dog is the smallest of the retrievers. The high-energy sporting breed thrives in a home with an active lifestyle—hunting, hiking, or playing are favorite activities. They're rambunctious and lovable companions who do well in dog-experienced families who aren't averse to training a strong-willed dog. The Toller is a hard-to-find breed, so it is important to ensure the temperament and energy level are a fit for the household before getting your heart set on one. The Nova Scotia Duck Tolling Retriever is often referred to simply as Duck Toller or Toller. Past names for this breed were Yarmouth Toller and Little River Duck Dog. Coat - The Duck Toller displays a rich red double coat. The water-repellent coat consists of a dense undercoat and medium-length overcoat. Moderate feathering is present at the legs and tail. Duck Tolling Retrievers were developed in the 19th century. The dog is meant to resemble a fox so when it is splashing at the edge of the water, curious waterfowl come in for a closer look. Once the ducks had been lured in, the Toller would run back to the hunter, who would stand and startle the birds into flight. The hunter would shoot, and the Toller would splash back into the water to retrieve the harvest. The Toller was based on the dogs kept by the Micmac Tribe for this hunting purpose, who were developed by the tribe to hunt like a fox. The mix—originally called the Little River Duck Dog for the area where it was developed—may include a combination of spaniels, setters, retrievers, and collies. Though the Canadian Kennel Club recognized the breed first in 1945, AKC didn't register the Nova Scotia Duck Tolling Retriever until 2001. Duck Tolling Retrievers are intelligent and eager to please, and they thrive with a job to do. With enough activity and mental stimulation, the busy Toller can be well-behaved indoors—but if they are bored or haven't had the opportunity to burn off enough energy, they may be destructive or disobedient. Without enough socialization, they may be wary of strangers and are often reserved when meeting new people, but are incredibly friendly and affectionate with family. Are Duck Tollers Good with Kids? Though friendly and good with older children, they may be too rambunctious for toddlers and babies. They're boisterous and playful and while they likely mean no harm, injury is a possibility. Are Duck Tollers Good with Other Pets? Their high prey drive makes them an unlikely match for small animals and cats, but Tollers usually get along well with other dogs, especially when raised with them. They may be able to be raised with dog-experienced cats, but the desire to chase may be strong. Nova Scotia Duck Tolling Retrievers may be suspicious of strangers, but will not guard or protect your home or respond with aggression. They will likely alert you to someone approaching the home, so they may make suitable watchdogs. Lots of exercise is necessary for the high-energy Duck Toller. Outdoor Spending time outdoors with family is always an exciting event for the Toller. Tearing through the fenced yard, jogging, hiking, and playing fetch are favorite activities for this active breed. A fenced area is ideal as the Duck Toller may roam or chase critters. Though the Toller is a hardy breed, they're not well-suited to live outdoors full-time as they prefer the company of family. If left outdoors alone, they may bark excessively or disappear in search of something interesting to do. Exercise Providing plenty of exercise is a priority for any Toller owner. They need at least an hour of vigorous exercise per day. Fetch, running, and agility are activities most Tollers enjoy. Endurance This gundog was built for endurance while hunting, and they have the stamina suited for a family with an active lifestyle. Running Miles: Healthy Duck Tolling Retrievers may be able to run up to five miles. Hiking Miles: A full-grown Toller may enjoy spending a full day on the trail. Food The recommended diet for most Duck Tolling Retrievers is 2½ to 3 cups of high-quality dry food daily, based on the dog's average weight and activity level. This amount should be split between two meals. Tollers do not tend to guard their food, but children should never be allowed to touch or remove food while any dog is eating. Alone Time A Duck Tolling Retriever can often be left home alone for six to eight hours if provided with a long walk before you leave and after you return. Crate training can help prevent destructive behaviors, but barking may be a concern. Weekly brushing and baths as needed can help cut down on some of the shedding that comes with owning a Toller. Seasonal shedding may require additional brushing. It is not necessary to trim the Duck Toller's fur. Trimming nails regularly will help prevent painful splitting, cracking, or a broken nail. You can minimize serious health concerns in a Duck Tolling Retriever by purchasing her from a reputable breeder who engages in responsible breeding practices, and through screening for common diseases and conditions. Intelligent Duck Tolling Retrievers are ready to learn—but aren't always willing to comply with your requests. Firm and consistent positive reinforcement training methods are the keys to teaching this quick-witted, strong-willed breed. Teaching basic manners and early socialization with a variety of people are ideal for a well-behaved adult Toller. Basic training won't be enough to challenge the Toller—they want to exercise body and mind. Advanced tricks, agility, flyball, and dock diving are all exciting ways for a Duck Toller to burn energy and put their sharp mind to use. Competitive dog sports are a thrill for the playful Toller. Fetch is a favorite activity, and they will play for hours. They're food motivated, goal-oriented dogs who enjoy working with you because it means they can spend time with their people. Tollers are good candidates for search and rescue and nosework. The breed standard requires the Toller have 'intense birdiness,' and a desire to retrieve. Tollers were developed as gundogs who could both lure and retrieve, so this breed is an ideal companion for waterfowl hunting. 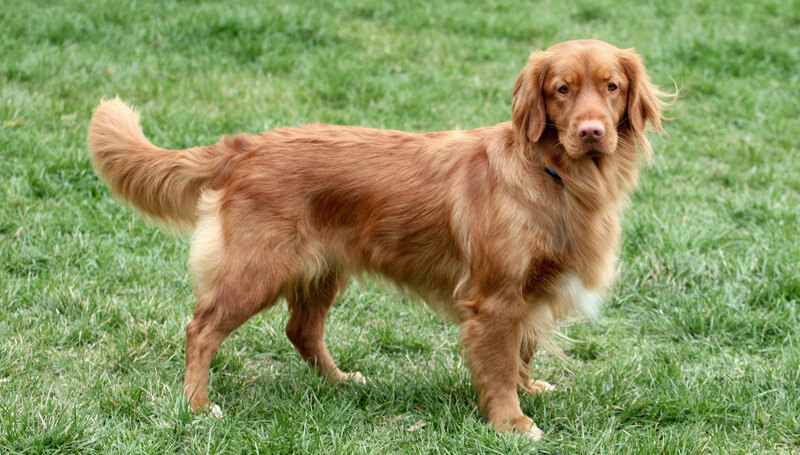 Can the Nova Scotia Duck Tolling Retriever come in other colors? While it is possible for a litter to produce a buff or fawn colored Duck Tolling Retriever, the color deviates from the breed standard. The dilute gene mutes the colors in the skin and coat, making fur and skin—including eyes and noses—lighter than a non-dilute Toller. Dilutes may be born in a litter with red puppies. No adverse health conditions are connected to the buff coloring, but breeding and showing a buff Toller is not allowed. A buff Toller makes a fine pet and hunting companion. Another coloring observed in the Toller is black or brown sable—an overlay of pigment that often produces darker ears and a mask that may fade as the puppy grows. What does 'Duck Tolling Retriever' mean? Tolling is the hunting style the Nova Scotia Duck Tolling Retriever is named for. The Toller entices, or tolls, waterfowl to the area by playing and splashing in the water and causing a commotion. After luring the birds in for a closer look, the Toller heads back to the blind so the hunter can take a shot. Then, the Toller retrieves the bird from the water. When excited, the Duck Tolling Retriever lets out a high-pitched shriek of joy or anticipation. Though it sounds horrific, it's usually done out of excitement rather than distress. If you live in an area where birds or squirrels are plentiful, expect to hear the Toller scream often.